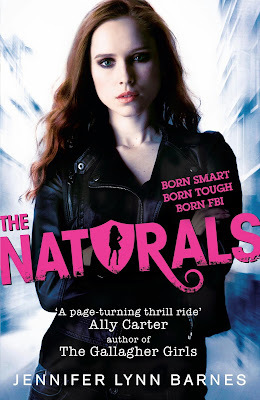 I was contacted recently by the lovely people over at Quercus about trying to make a big splash over the UK cover of this new book, The Naturals by Jennifer Lynn Barnes which is being published here on the 7th of November. It's the first in a new series by the author of the Raised By Wolves series and I happen to adore it. All of the psychology that Jennifer Lynn Barnes writes into her stories absolutely appeals to my inner psychology-nerd! What do you think of the cover? I like it. I love the font used especially. When I was younger, there was a TV programme that my dad and I would watch together called The Profiler. I remember every week we'd watch it and then afterwards we'd sit and discuss the latest plot twists and story progression. I have a real fondness for that show. There have been other more recent crime shows that deal with profiling but that is still the show that has stuck with me. I find it all very fascinating. So with that in mind, when I heard that Jennifer Lynn Barnes was writing a new series involving young people solving crimes using different types of forensic psychology I really couln't request the book quick enough. I loved Jennifer Lynn Barne's previous YA series about werewolves and I loved how her background in psychology gave the story this added depth and another layer to the story that I found fascinating and I was sure that I would love The Naturals just as much. And you know what? I did. More so, even. With an interest in psychology myself, I lapped up the different ideas and talents that surround the other characters that Cassie comes to live with. She ends up meeting some very different and interesting people. I loved straight-talking and snarky Lia, and Sloane, the numbers/statistics girl who becomes Cassie's roommate. The relationships between the three girls was quite interesting to watch enfold, especially as it was a pretty rocky start with Cassie and Lia. But I think the interactions between Michael, Cassie and Dean were my favourite. Yes, it is sort of a love triangle and some may groan and roll their eyes, but I enjoyed it. Especially when it came down to playing 'Truth or Dare' with people who can spot lies and/or can sense other people's emotions. My favourite aspect of The Naturals is, of course, all of the psychology, the characters and their relationships with each other but there is also a really surprising and thrilling mystery at play here as well. With snippets from the mind of a serial killer interspersed with Cassie's narrative, there is a steady build-up to very actiony finale. I was on the edge of my seat and really didn't see that coming! I am very much looking forward to reading more in this series! I love the idea of a teenage crime-fighting unit with special abilities. It fills me with excitement! I'm not all that keen on the cover - but then I generally don't like book covers to have people on them as it gets in the way of me picturing the character in my head. The synopsis sounds really cool though! It was probably different for me, Maya. As I read the book before I saw this cover.. It is a really great book. I like this one much more than the US cover for the book! Do you? I quite liked the box with the police tape.. but, this cover would probably tempt me more to pick it up in a bookstore.